Biopics make subjects immortal by placing the story behind the story in focus on camera. However, biopics are not new to Bollywood even if they are currently fashionable. In the past they have been made about prime ministers, good and bad, and the great patriots of India giving us freedom, especially from the British Raj. Thus, they have been about people being downtrodden but fighting back by joining together under their common cause to in their own way deliver a punch to oppression. What has changed in recent years is the nature of the biopic going from the martyrs of the nation to more everyday heroes. Instead of Subhash Chandra Bose, we now have Soorma. Instead of Gandhi or Nehru we now get Bhaag Milka Bhaag and MS Dhoni: The Untold Story. Still these characters have stories of loss and oppression, but they are less about things that define a nation and more about those things that define us and our modern heroes in the field of their choice. Sanju is the latest of these, starring Sanjay Dutt as depicted on screen by Ranbir Kapoor under the direction of Rajkumar Hirani and production by Vidhu Vinod Chopra. Sanjay Dutt is certainly a meaty topic to try to depict on screen. 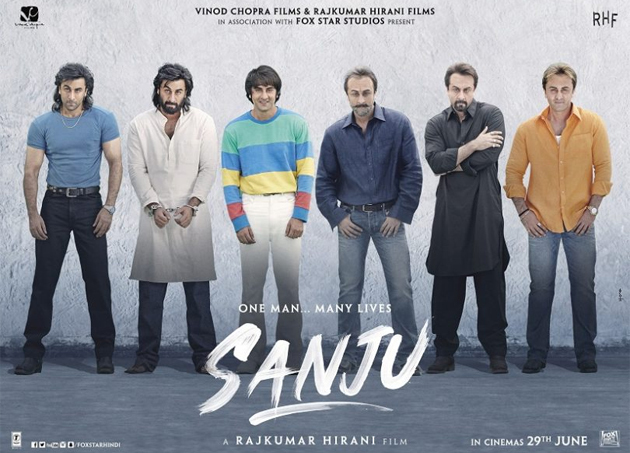 The early teasers for this film showed Ranbir pull out all the stops to show us all sides of Sanju Baba; terrorist, drug taker, actor, villain, humanitarian, a depressed and simple human being. And the movie itself doesn’t disappoint there. Having come from fine stock in Sunil and Nargis Dutt, both fine actors of their age, Sanjay Dutt’s life is both privileged and stressed depending on how you look at it. Ranbir as Sanjay Dutt, Paresh Rawal as Sunil Dutt and a small appearance by Manisha Koirala as Nargis Dutt are all superb in their roles, each not only looking the part but also seemingly having done plenty of research beforehand into their characters to bring them to life on screen. Ranbir is especially good at playing the chameleon that is Sanjay Dutt from the young good-looking hero, through the drug years, out the other side with rehab and the various allegations and eventual jail time for terrorism charges. All through and through making one hit film after another, growing fondness for his performances in audiences hearts. The cinematography of the film highlights this in all aspects, whether doing a panning shot of Sanju strolling along poolside in Mauritius, capturing the splendour of Marina Parade in front of his apartment building or the dark room in which Sanju refuses to do a dark deal that would give his father a bad name, even though it guarantees him a way out. No shot is wasted, with many close-up clips to highlight the effort each actor has put in to play his or her part while also stepping back to allow us to get a sense of the character’s body language. Nevertheless, the story of a biopic aims to put the main character in a good light even if that person has been accused and been to jail for terrorism. Here the story is unequivocal in being pro-Sanju, showing up journalistic trickery by using the question mark to seemingly make any accusation the journalist and news editors want to print against Sanju. While there isn’t a detraction from the facts upon which his conviction was laid, the perception of what happened is heavily brought into doubt by the story. We must keep in mind that terrorism meant a different thing in a pre-9-11 world. Into all this comes Anuskha Sharma, a writer and journalist who Sanju asks to tell his story before he goes to jail. To an extent, the story is told from her perspective from her introduction onward to try and deflect from the viewpoint that things may be biased against the media, but this does seem to fail at the end of the day as she reunites friends (played by Vicky Kaushal) to bring the story to a happy ending. The music is light at the right points and hits hard too at the right points but is not particularly memorable. It is simply a background to a power performance whether being given by Ranbir and Paresh Rawal, or through a lot of cameos from great actors like Dia Mirza, Sonam Kapoor and of course Manisha Koirala. Yet, a power ballad like ‘Kar Har Maidaan Fateh’ is bound to inspire some audience members to strive for better, which can’t be a bad thing. Being based on a true story with the biased angle, its hard to decide how good a biopic this is. Especially so since many of the audience are people who were alive and were aware of the events happening that are portrayed in the film. Like Soorma it’s heavily pro the main character but Sandeep Singh never courted as much controversy as Sanjay Dutt. Like Gandhi (1983, directed by Richard Attenborough), it tells the story of a man oppressed by journalism who turns that journalism to his own advantage; but Sanjay Dutt has never really gotten away from the label of that AK56. Still, as a movie it has decent music, great visuals and superb acting from all involved. Then of course there are all the names involved, each of which has taken the risk of not only being slammed for working on this film but also breaking relations with Sanjay Dutt himself. At the end of the day, however much truth there really is in all of this (which is at the heart of a biopic), its two and a half hours of great entertainment for people of all ages and lifestyles. 16 queries in 0.711 seconds.